Graduated from your old prep school uniform? Trade it in for a more grown-up version that’s stylish and age-appropriate. With our roundup of sweet pleated skirts, oxford shoes, letterman jackets, and more, you’ll have a stellar style report card in no time. ​Scroll through our 24 back-to-school picks now! ​If argyle’s for nerds only, sign us up. 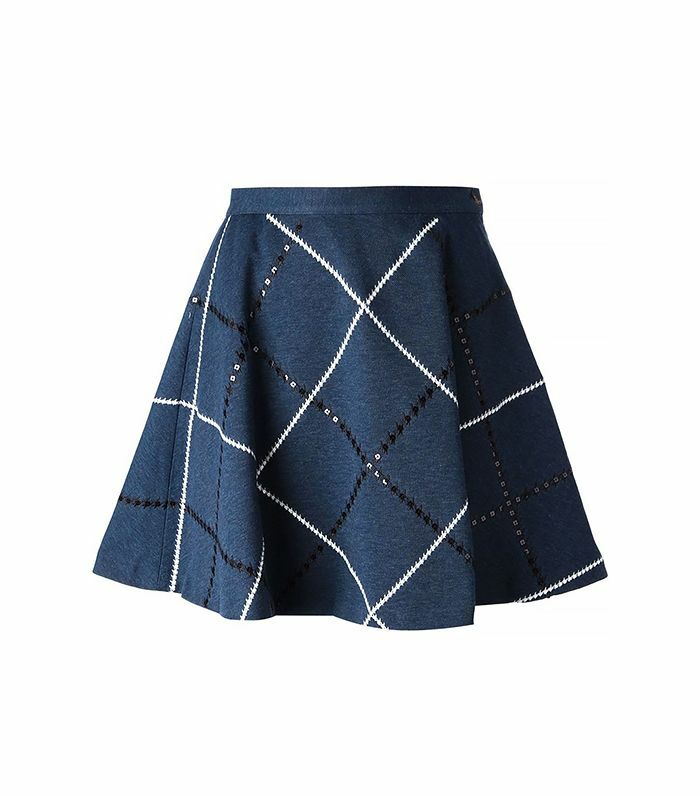 We love the back-to-school pattern, especially in the form of this stylish skirt. ​This color-blocked, minidress features a kicky hem for an ultra-flirtatious touch. ​If you want to thoroughly nail the schoolgirl look, a pair of socks, which pair well with oxford shoes, are a must-have. ​This cropped, double-breasted blazer is the ultimate ladylike cover-up. ​Who needs a varsity athlete to keep you warm when you can have this cool letterman jacket instead? ​This barbed headband puts an avant-garde twist on the generally sweet schoolgirl accessory. ​We love the relaxed shape of this classic tuxedo blazer! ​Looking for a more playful pair of shoes? Try these fun checked oxfords. ​This darling bow top is so Blair Waldorf, don’t you agree? ​Use this sleek, skinny belt to belt your fall and winter coats! ​When you’ve got a lot to carry, this backpack is a casual and convenient alternative to a shoulder bag. ​We can totally see Sally Draper rocking this leather mini, which comes in a deep oxblood hue that’s perfect for fall. ​This sweater’s embellished collar and electrifying red color will make hitting the books or heading to work a tad more exciting. ​Scallop trim lends a feminine element to these sleek ankle boots. ​Pull a Peter Pan in Ted Baker’s cute collared shirt. ​Dress down this neoprene skirt with a t-shirt and lace-up oxfords. ​We’re not 100 percent sure if these punchy plaid trousers are dress code-proof, but they certainly make a stylish statement. ​This staple piece has a classic, feminine shape that lends itself to multiple styling possibilities. Try it with ankle boots and a statement jacket. ​Edgy safety pin embellishments help balance out this skirt’s sweet flared silhouette. ​The Mary Jane’s sparkly, grown-up cousin called, and she’s definitely going dancing once class is out! ​Did your boss just use a word that went way over your head? We can’t help you there, but at least you can look like a vocab nut with this cheeky clutch. ​Channel your inner ballerina in this slightly stretchy, flattering wrap top. ​These glossy loafers will add a cool element to a simple button-down and jeans. ​Ever have to wear a school uniform? Did you love or hate it? Let us know in the comments section below!